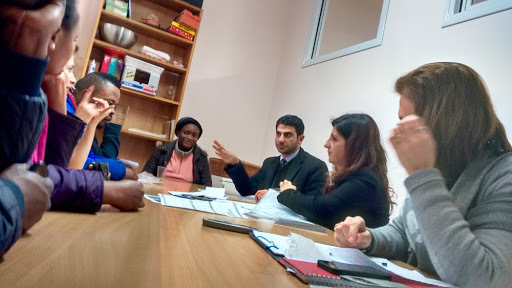 Today we had the meeting with Caritas and their lawyer to try to straighten out the myriad of legal difficulties facing the Group of Five plus One-- the Nigerians we are trying to help. F had done a test run to find the location of the main church in Montecatini, but we still arrived 15 minutes later than I would have liked -- or as I like to call it -- SHT (Standard Husband Time). To be fair if I had married an Italian, I would have had a worse acronym and I would have arrived even later. All of the group members made it to the meeting, except for Emmanuel who is still holed up at the camp in Calabria. We conferenced in the one person we found that could talk about his legal situation in Italian. As we sorted out everybody's documents, the issues seemed to multiply. 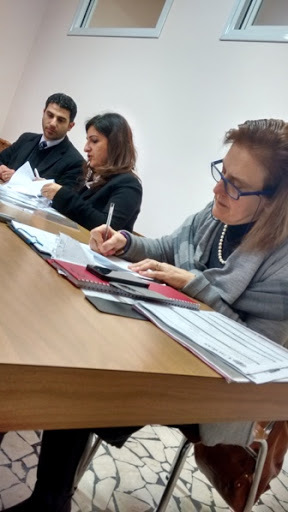 The Caritas lawyer was finally able to Scooby Doo the situation and track down the name of Emmanuel's original lawyer so that we can be informed of whether he will be able to stay in Italy or not when that individual arrives with the decision on his appeal this weekend. Tina, who is now almost five months pregnant, got turned away from free health care because she could not prove her residency. She was asked to pay 400 euros. She can't renew her permesso which is about to expire because she can't get a letter of hospitality. I can't even host her because I am in Lucca instead of in Montecatini. After a quick review of our rental contract, the unoffcial legal strategy, as I understand it, is for her to arrangiarsi da sola or take care of it the way Nigerians whose housing has not been provided for them are forced to do. Basically all of us in Italy understand that she is going to pay out a 200 euro bribe to get a fake hospitality letter from a Nigerian who is in possession of residency and a job perimt and who may or may not just take off with the money. However, this is the only option that Nigerian immigrants who do not receive welfare have left. Cool and Job have both lost their high level stay permits from their own open pockets and only Cool has managed to get his reissued. Job runs around from police station to police station being told that he is in the wrong place. He would like a letter to encourage the good folks at the police station to find his kit and reissue his documents. He kept nudging me the whole meeting and shoving his useless plane tickets to Nigeria under my fingers. His mother is dying and he wants to go back to say goodbye. Well, she may not be dying, but she is very sick. Well, it is not his mother; it is his father. . This is how the meeting went. It reminded me of sitting at Community Access on the lower east side of Manhattan with old Mr. McCallum, who was a blind, veteran, amputee, while he watched Days of Our Lives and roaches literally rained down on our heads from his ceiling. Good times. Anyway I kept hissing at Job to please not make me have to tell the lawyer about his unused plane tickets. He could not take the plane because he lost his documents. I understand that it is sad, but he has a pregnant wife with no home and expired documents and no health care and I was trying not to make the lawyer's head explode as she realized that Jennifer whose last name is Lawrence has no permesso and is going to give birth in less than a month and a half. The situation became so absurd between all of the fake hospitality letters, false addresses, desperate circumstances, and illegalities that I had to make an admission to the Caritas representatives. 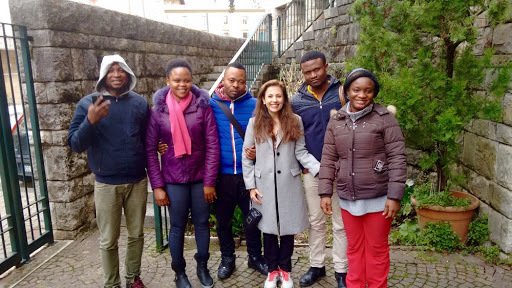 I told them that when I decided to help six Nigerians who were buried in Italian bureaucracy and trapped in an unjust living situation, I had no idea that they would have more drama that Un Post al Sole, the famous Italian soap opera. Imagine my surprise, when the head lawyer broke into a huge smile and said that the unused ticket was just the excuse she needed to put pressure on the police to release the reissue of his stay permit. 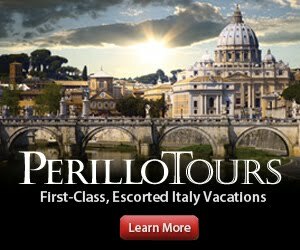 Ms. Lawrence and Tina both implored me to let them choose their own housing and get the catholic charity to pay for it, but I had to tell them AGAIN that that possibility was not even on the table, as it does not exist in Italy. Jennifer asked me to leave the meeting so she coud ask if she would still have to beg for money after they gave her a place to live. I explained to both women AGAIN that we were doing all this because if they are in the care of a charitable association they will not have to beg anymore. Paul on his part always looks sad and helpless at these meetings and I always pass him off as the young one who is completely alone. He is only 27, but he is hardly a child. However when Maria Cristina came out with a donation of fried plantains from Africa in plastic snack packs which she distributed to the whole gang, he ripped into them like Cookie Monster from Sesame Street on a bender and chewed them up smiling from ear to ear and spraying plantain crumbs every which way. It is hard not to love Paul. The last surprise of the day was that Cool and Jennifer Lawrence are getting married the day before Easter and we are invited, even though I have no shoes. That should be blog-worthy. There's a movie that is very popular in Lucca right now called Perfetti Sconosciuti where a bunch of old friends have a dinner party and agree to leave their cellphones on the table in open view. Most of the couples' relationships unravel in the span of one evening and you realize that people's lives are more complicated than you think. Well, that whole film looks Disney in comparison to the drama we watched unfold today at Caritas.